Ups & Downs: Wort pump & Southern Hemisphere Harvest..
Wort pump & Southern Hemisphere Harvest..
Standard March 809 wort pump (food grade pump) mounted in a small tool box..
Then, wire up the switch (upper left hand corner of this picture..) and the recessed male plug connector (the ingenious part, in the lower center of this photo.. stand by or more).. The outside front view of this puppy, with the installed ON/OFF switch located just under the front cover of this top box flap thingy, the extension cord plug whoosey in the front and the pump connections located just to the right of the box. And a shot of the plumbing here on the pump side. The beauty of this is, there's no extension cord hanging about. You use it and then store it. You don't need to go out and buy one specifically for your pump box here. The toolbox also gives the pump a much more stable platform from which to do it's thing.. which is why I broke it so long ago to begin with, cause I flipped it over and snapped off one of the outlets. Now, I've got a stable base to work with so hopefully all should be well. 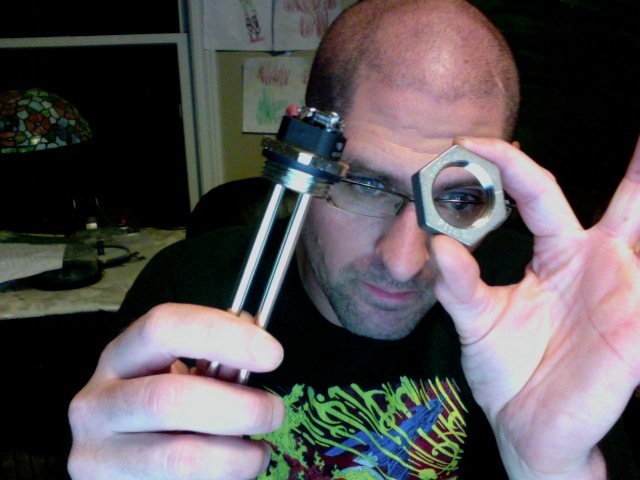 What you're looking at there is a 3500 watt heater element in my right hand and a 1" NPT locknut in my left. The locknut and element merge well together, straight thread and NPT threads notwithstanding, and will enable me to get said heater element mounted into the side of my HLT so I can electrify it for superior heat via 240 volt current. Yeah, we got that here. Sierra Nevada Southern Hemisphere Harvest. F'ing great beer! Taking notes on my iPod.. err.. I just found out the notes I took on my iPod were just totally wiped out. Huh? Ok, going from memory.. I recall a really wicked hop attack that followed a really nice, pleasant malt sweetness and mild.. err .. something. There was something there alongside the malt, I remember that much. The hops pretty much decimated the malty-ness a few seconds after you got a taste of it.. but I wasn't complaining. The hops were some kinda citrusy and something else I can't recall. That's pretty insightful, I know. Like I said, my notes were destroyed. Drats. All in all, I gave this bombshell a double thumbs up, despite it's huge blast of hops that was totally out of whack. I mean, that's why you're buying this beer. It's huge! It was easily as big as any of the West Coast IPA's I drank when I was in CA a little while ago.. but really well done, and arguably better than most of not all of those previously mentioned beers. Really well done. Go get one or seven of these right now. You'll thank me later. I have some more I'd like to write, but I'll have to handle it another time.. things to do, places to go. Stay tuned..